The C11 MSL Black Manta MK1 Automatic is an automatic watch from the guys and girls over at Christopher Ward, a high-end English watch company. 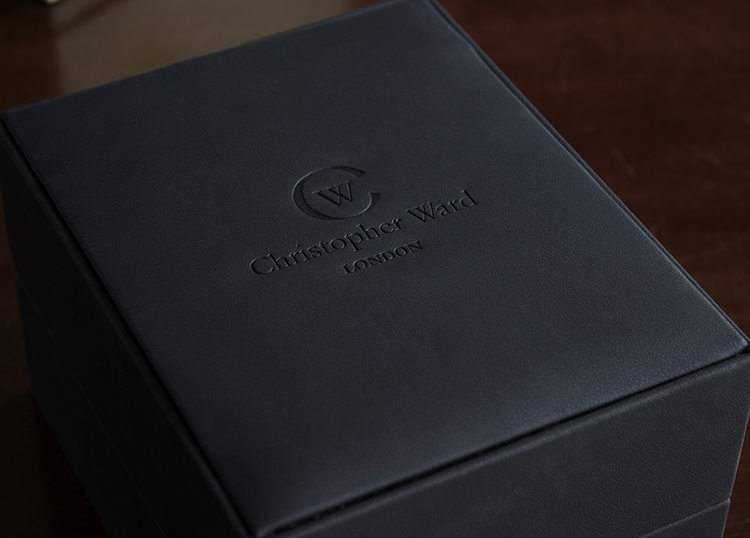 Christopher Ward have an interesting story and brand ethic. They were founded back in 2004 from a boat on the River Thames, London, by three people with the aim of bringing premium quality watches to ordinary people: “the cheapest most expensive watches in the world”. And that they have done, with their highest end watches costing less than the cheapest of other watch maker’s watches. All without sacrificing precious quality. They do this by only selling watches through themselves with no middlemen, thus reducing marketing costs and making them more exclusive. Typically, the jewelers who are the middlemen mentioned here, will take the wholesale prices of watches that they buy them for and double that on the price tag. Most watchmakers end up selling their watches for an astonishing 10 times what they are made for, with Christopher Ward this is only 2-3 times. Transparency is something I admire in a brand. All Christopher Ward watches are Swiss made; assembled by hand in Jura, Switzerland to be more exact. They are also all hand-checked by Christopher Ward himself and you’ll receive a letter thanking you for your purchase signed by him and a certificate of authenticity. Also an extremely soft micro-fibre polishing cloth. 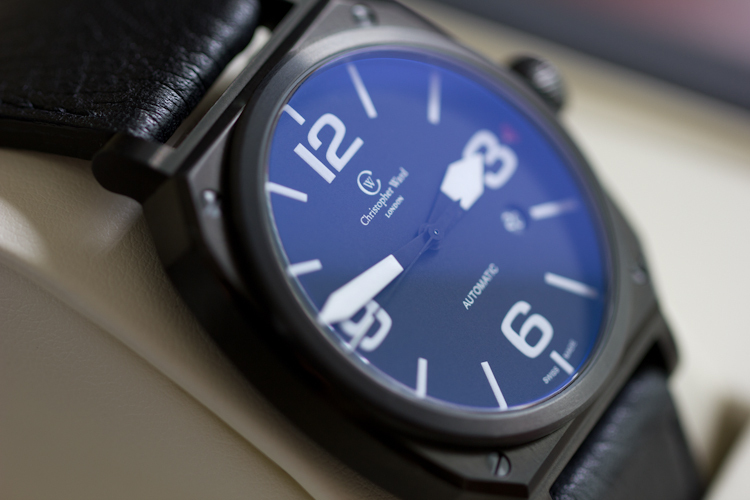 The C11 MSL MK1 design is inspired by a modern jet’s altimeter, and it really would not look out-of-place as a precision instrument in the cockpit of a fighter jet. Its slick, easy to read face gives it a very high-end aesthetic. Furthermore, it has four screws in each corner to make it look even more like an aviation item, and this works well. If I’ve ever seen a pretty screw, it’s here, they are brushed into concentric circles which makes them pick up light in an almost captivating way. I also love how they aren’t all straight, some people have mentioned this as a flaw, but I actually think that it adds to its handmade feeling; it would seem very mass-produced if they were all facing in one direction. Unboxing the watch is a true experience, it’s apparent from the set-off that you are opening a luxury item; and because they are sent out with special delivery you won’t have to wait long. Mine arrived after less than 24 hours! As soon as you open the shipping box to reveal the cream, logo-foiled box you know that you’ve received something special. The cream box’s lid pulls off and the front of the lower part of the box has a loose side for the leather box containing the watch to slide out. The black box which slides out radiates quality, with Christopher Ward embossed on the top and a spring-loaded hinge mechanism. Inside the flip-up lid is a cream interior with a silver Christopher Ward logo and the C11 MSL MK1 attached to a cream, oval 1.5 inch wide object. This leaves a great impression. The C11 MSL MK1’s body is constructed from a high-grade surgical-grade stainless steel, 316L. This is a low-carbon steel and the most common that is used in high-end jewelry. This is coated with PVD into a black colour. This isn’t the darkest black compared to the strap, which is carbon black; it is hard to explain the colour of the face, but it is captured accurately in the photographs. I’m not complaining, though, I think this is quite attractive and I personally prefer it. The shape of its body is attractive, it has a slim profile at .9 cm out from the wrist. It weighs 108g which might seem heavy, but its heaviness isn’t a dead weight, it feels like a quality item in your hand and on your wrist it sits well and doesn’t seem to weigh your arm down. On top of the initial bulk of the size sits an additional round part, this seems to house the sapphire crystal which is set into it. Its diameter is 42mm. Its body has a very pretty finish, it is what I’d call satin; not matte and not quite gloss. This is achieved with vertical brushing which also makes it catch the light in a way similar to the screws. As mentioned earlier, the C11 MSL MK1’s face is easy to read and very pretty. The striking contrast between the white numbering and tips of the hands between the matte black backdrop makes it extremely clear, especially under the anti-reflective sapphire crystal. The hands are painted only at the end which gives the effect of them floating which is a cute touch. The date is also detailed on the face, right by the ‘4’ marker, slanted at a matching angle. I feel like the minute and hour hands respectively are the perfect size, as well as the second hand; the hour hand coming up to just before the time-indicating dashes and the minute hand being roughly 2mm away from the edge of the face with the second hand just slightly shorter than the minute hand. Christopher Ward London, their logo, automatic and Swiss made are all detailed on the dial in a very thin but readable type. Everything that is painted with white on the face is coated with SuperLumiNova, which is a non-toxic and non-radioactive photoluminescent, meaning it glows in the dark. It is waterproof to 10 atmospheres (atm) which is 100m underwater, but make sure that the crown is pushed all the way in before you get it anywhere near water. It isn’t recommended that you dive with the C11 MSL MK1, but snorkeling should be just fine. If you do happen to dive, Christopher Ward make some really awesome diving watches too. Its ‘glass’ isn’t actually glass, it is sapphire crystal. It is referred to as glass because of its transparency, not because it is actually glass. The crystal used in this particular watch is museum-grade. It has a very slight blue tint when you see it from a certain angle but it is crystal clear under most conditions. It took me a while to stop gawping at just how clear it is. I’m the kind of person who bangs their head on the aquarium glass because they don’t see it, and I’m very glad that they don’t make them out of this. Sapphire crystal is extremely scratch resistant naturally, and it is coated with an anti-reflective coating on the outside. There are three main ways to treat sapphire crystal with an anti-reflective coating, from the inside, from the outside, and both; although from the outside shouldn’t be quite as effective as the other options it is still amazingly non-reflective. I wish my devices’ screens were made from sapphire crystal and coated with an anti-reflective coating; I also wouldn’t mind if they were waterproof to 10 atm either! The watch’s crown has the Christopher Ward logo on it and around the edge is engraved diagonal lines to add grip and aesthetic appeal. This shows the attention to detail Christopher Ward put into each detail of their watches, however miniscule. The C11 MSL Auto’s strap is genuine Italian leather and as with all leather products, it smells great. With the Black Manta model, the included strap is black with a classy cream underside. On the cream underside is embossed Christopher Ward, their logo, and the fact that it is a genuine leather product. It has 10 holes for various sizes of wrist, I have a very small wrist (6 ¼ inch) and the smallest hole just fits me, and the main body doesn’t even look too big on my wrist which is fairly unusual. The 22mm width strap also spreads the 108g weight of the main body of the watch nicely onto your wrist. The buckle has a finish that is the same as the main body’s, it even has the decorative screws which have become characteristic of the C11 MSL MK1. Christopher Ward is also very delicately engraved into it. The way in which the strap attaches to the main body of the watch isn’t the usual way which needs a tool to change the strap. It uses a quick-release mechanism which is spring-loaded. You simply pull back a small metal pin with your nail and the strap comes right off, and is very easy to put back on. The C11 MSL MK1 has an automatic movement that is made by Sellita. The exact movement, the Sellita SW200-1, has a good reputation for being reliable and accurate. Inside, it has 26 jewels on its Swiss movement. Having jewels hidden away inside may seem like a waste, but they are there for good reason. A watch’s movement generally has around 211 parts, and the majority of them are constantly moving. As you know, when you rub your hands together they get warm, and if you did it for too long they’d get sore because your skin would start wearing away. A similar thing happens to the wheels in a watch, the friction wears them down and after a while shows an incorrect time, but by using jewels as pivots and axles, the friction is dramatically reduced and they stay healthy for much, much longer. It vibrates 28,800 times per hour and has a power reserve of 38 hours. Also be sure to keep a good maintenance schedule to keep things running smoothly. Incorporated into the movement is an Incabloc anti-shock system, using a series of small parts and often jewels that I talked about earlier. It means that your watch can survive a small fall onto a carpeted surface and other small knocks, but you should still be careful. The C11 MSL MK1’s backplate is very pretty, engraved with a fighter jet and ‘pervenio pro altrum altus’, Latin text which translates to ‘Reach for the Stars’; very suiting for an aviation watch. Underneath this is ‘Swiss made’ and a unique engraved serial number which is different on every watch. The C11 MSL Black Manta MK1 is an amazing watch, even if it is a bit of a chore to say. At £499, it’s fairly cheap for a watch of this quality, and I daresay it’d be hard to find a better value watch at this price. The face is easy to read, it’s accurate and it also sounds amazing when held up to your ear. You can purchase it and browse other Christopher Ward watches here. Former Vice President of Previous Magazine, Clikyz and Split An Atom. Avid photographer and keen to adopt the latest technologies. Circle me on Google+.